In the first decade of the 20th century Harley-Davidson rose from amongst hundreds of similar small American companies engaged in the production of motorised two wheel transport and was soon to become the world's pre-eminent motorcycle manufacturer. During the company's second decade Henry was to cut the price of his Ford cars, and the conversely more expensive motorcycle became increasingly a recreational vehicle. A previously utilitarian means of transport became a fashionable consumer item, encouraged by sporting successes, and by the end of the twenties the Milwaukee plant was producing more than 24,000 bikes per year. 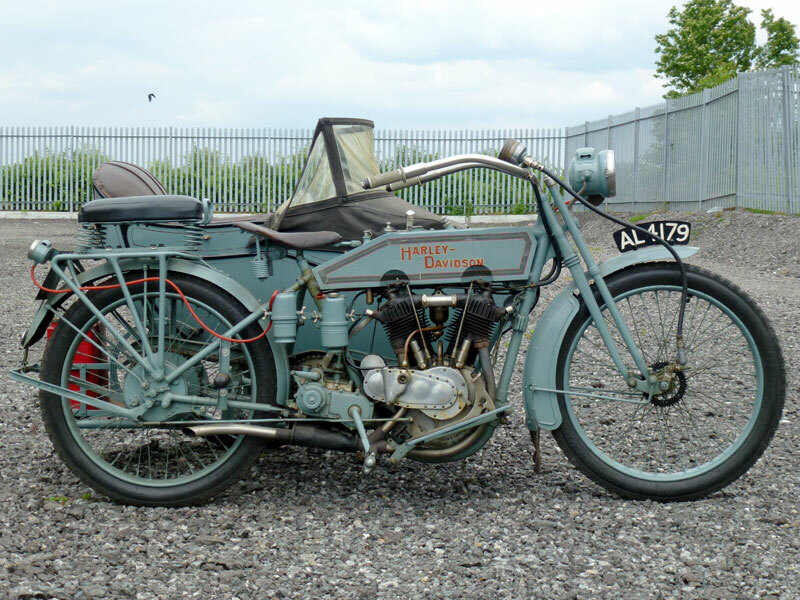 1915 was a watershed year for H-D and saw the introduction of the H & J versions in the Model 11 series. Electronics were now more widely employed and on these models electric lighting could be specified for the first time. Engines were significantly improved with new larger cylinders, valves, manifolds and flywheels, increasing power by one third up to 11 h.p. Some 3,700 were made selling at a price of $310. To accommodate the larger dimensions of the new adjustable valves the engineers had to cut notches in the lower edge of the fuel tank, an identifying feature displayed on the Model 11 we see before us. This nicely presented example has formed part of a private collection for a number of years and until recently was displayed in a museum. It is offered with the benefit of the attached, period sprung sidecar to boot, this machine represents a superb example of the veteran motorcycle at it's best. Registered AL 4179 and accompanied by a Swansea V5C, the 1915 989 cc V-twin H-D Model 11 is entered at a realistic reserve, and, as they say 'Could be Yours! '.